“Keystone species" is a term used to describe a species that has a disproportionately large impact on its environment relative to the quantity of that species. This means that the effect they have on other plant and animal populations' variety and strength in their native environments, and the role of keystone species in maintaining the ecosystem in which they all live is enormous. The term "keystone species" comes from the architectural keystone at the top of the center of an arch, which is the stone which feels the least pressure but upon which the entire arch depends. If the keystone of an arch is removed, the entire arch collapses. Since the aim of BGTV's section on endangered species is to show the ways that species and their environment are interdependent, there may be no better animal for our inaugural article than the bison, both an enduring emblem of the old American West, and the keystone species whose decimation indirectly led to the demise of the old American West. The fate of the bison is a cautionary tale. Most people have only seen bison in movies about Native Americans and their vanished way of life. Millions of bison once roamed the American Great Plains, and their behavior, grazing, and migratory patterns had a decisive influence on the ecology and shaping of that region. The more simplistic story has traditionally held that, as Euroamerican settlement advanced westward into Native American territory, unregulated shooting to supply the bison fur robe trade and the bison hide market—commercial hunting which led to what can only be described as full-scale slaughter by the 1870s—reduced the bison population to near extinction. 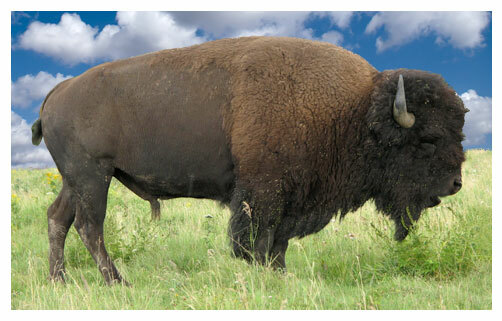 By 1890, from a population which at its high point numbered between 20 and 30 million, barely 1,000 bison remained! This story is true, to a greater or lesser extent, but the real story, according to environmental historian Andrew C. Isenberg, who teaches at Temple University, is much more complex. Isenberg maintains that in the traditional story of the destruction of the bison, not enough importance is given to two factors: the volatile natural environment of the Great Plains region, and the effect of Euroamerican expansion on the society, economy, health, habitation, and hunting patterns of the Plains Native Americans. Because of the unstable natural patterns in the Great Plains, bison populations were vulnerable to death and depletion in their populations from drought, blizzards, wolves, drowning in rushing rivers during spring migrations, and competition for food sources from other species. Previously, the Native Americans had functioned in largely agricultural settlements and had employed what is called a diversified resource strategy, which means they used a wide variety of resources to meet their needs, so that no one resource—bison, for example—would be stressed from overuse. When Euroamericans brought Old World diseases to the New World, the Native American communities had to break up and move west in order to not be wiped out from diseases to which they'd had no previous exposure and against which they had no resistance. Their way of life had to change and adapt to a constantly changing environment. As the Plains Native Americans had to adapt themselves more and more to the market economy of the Euroamericans, and as the technology introduced by the Euroamericans gave the Plains Native Americans a disproportionate advantage against the bison in the hunting process, the bison were not able to rebalance their herd sizes when the natural environment killed off large numbers of their species. Through a survival strategy of participating in the commercial hunting of the one species on which their survival depended, the Plains Native Americans shared the fate of the bison. It is a dynamic that we must be aware of today as we see the effect that species depletion, technology, pollution, and economics are having culturally and socially worldwide.